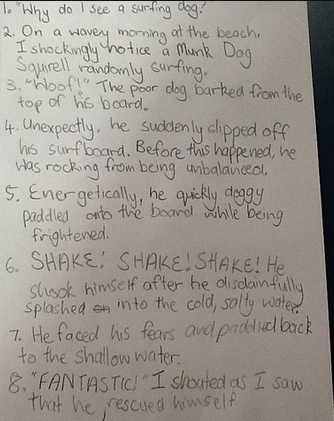 We had to write a 10 sentences story from one picture. 1. "Why do I see a surfing dog?" 2. 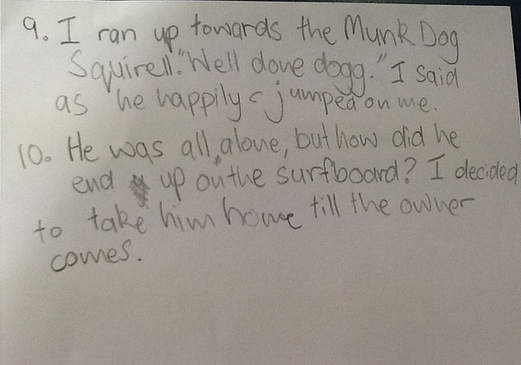 On a wavey morning at the beach, I shockingly noticed a 'Munk Dog Squirrel' randomly floating on a surfboard. 3. "Woof!" The poor dog barked from the top of his board. 4. Unexpectedly, he suddenly slipped off his surfboard. Before this happened, he was rocking from being unbalanced. 5. Energetically, he quickly doggy-paddled back onto board while being frightened. 6. Shake! Shake! Shake! He shook himself after he disdainfully splashed in onto the cold, salty water. 7. He faced his fears and paddled to the shallow water. 8. "FANTASTIC!" I shouted as I realized that he rescued himself. 9. I ran down onto the crunchy sand towards the Munk Dog Squirrel. "Well done doggy." I said as he happily jumped on me. 10. He was all alone. But how did he end up on the surfboard? I decided to take him home till the owner comes and picks it up. Hey Hosannah! I am Jasmine Smith and I am a student at the University of South Alabama and I am currently taking EDM310. Your blog post is very interesting. I loved your story. I also enjoyed your choice of vocabulary. Well done! Keep up the good work!! My name is Kameron Strickland. I am a sophomore at the University of South Alabama. This post is very creative! I love how you did not just call it a dog, you added to it. You have great potential as a creative writer. Keep up the great post for 2013! !